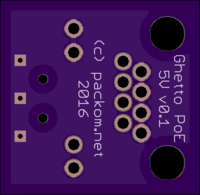 2 layer board of 0.77 x 0.75 inches (19.5 x 19.0 mm). Uploaded: October 25th, 2016 14:22. 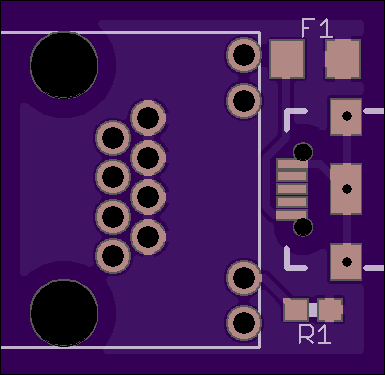 A board designed to take 5v from a micro USB connector and send it down a CAT5/CAT6 cable for breakout and use at the remote end. 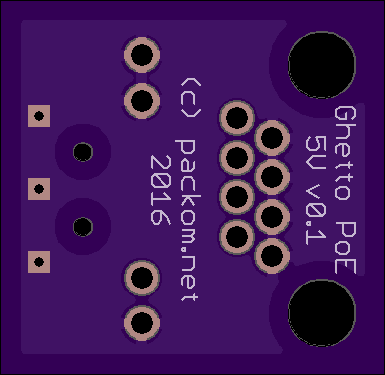 The board sends power down all 4 pairs, so the current carrying capacity is maximised, and should be good for around 500mA. Note that voltage drop will be an issue over long cable runs. An RJ45 port, with LEDs (of which only the right, green, one is used to indicate power). I’ve used the Amphenol RJHS-4081. 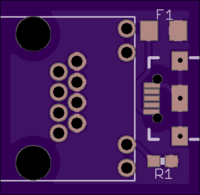 Micro USB PCB mount connector. I use cheapos from aliexpress. A current limiting 0603 resistor for the LED - I’m using a 1.5K to keep power use down. A 1206 0.5A hold current, 1A trip current resettable fuse. I’m using Littelfuse 1206L050YR.